If you require a child seat, please, when replying to our emails concerning your paid invoice; write this in your reply, stating the age(s) of the child(ren) in your message. You cannot book a car with us and include the child seat in the payment process, as these are optional extras payable during the car collection. 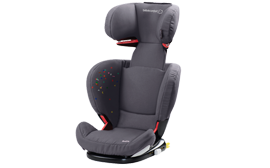 Child seats cost 3 CUC per day and we simply advise the rental desk of your need and child age in advance, so that they can take the necessary steps for when you arrive.